Moving is hard. We know that. Our job at Cassidy’s is to make it as easy on you as possible. We’ve been moving people’s homes since 1908, and our expertise is at your service. 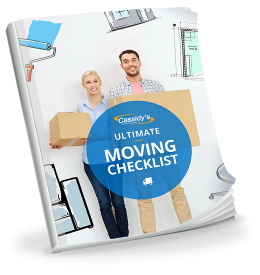 Cassidy’s has a plan for every kind of move in every season – especially the busy summer months – whether you want to DIY as much as possible or you just want to stand back and let the professionals do it all. Are you moving within the Ottawa Valley? Looking for someone to help you get from Barrhaven to Kanata? Cassidy’s is there for you with offices in Ottawa and Pembroke, and you can view our Ottawa moving service area map here. From the smallest apartment to the largest house, let our trained Ottawa moving crews make your move easy. You can do all the packing yourself, some of the packing yourself (we can help you get all the material you need) or you can let us do all the packing and moving. It’s your choice. It starts when you contact us. We’ll arrange for a professional Moving Consultant to come to your home and provide you with a detailed evaluation of the amount of belongings you have. We’ll outline the services available to you, and the costs for the different options. The best part? Your consultation is free! Moving to another city? It doesn’t matter if you are moving 100 miles or 10,000 miles, Cassidy’s will help. If you are moving across international borders, Cassidy’s will make sure you have all the paperwork necessary to make your move worry and bother free. You can learn more about our long distance and international moving services here or contact us for more information on long distance moving. We can save you time by providing all the boxes and other moving supplies you need – right to your door. We can deliver a secure self storage container that allows you to move at your own pace and save money. Why go through the hassles of borrowing or renting a truck? We bring the container to you, drop it on the ground for easy loading and unloading and take it to you new home or to storage. You take your time and do the job you want to do, but Cassidy’s takes away the headache. Visit our Store and Move site for more information. Do you need packing material? Cassidy’s can help there too. Do you need to store a little or a lot? Do you need to store for a day, ten years or anything in between? Do you need climate controlled inside storage or do you need storage in a fenced compound? Whatever your storage requirements Cassidy’s has a solution for you. If you want to do-it-yourself and have your goods stored in our secure, fenced compound please see our Store and Move site. If you want Cassidy’s to do it all, contact us for more information on storage or request an Online Estimate.